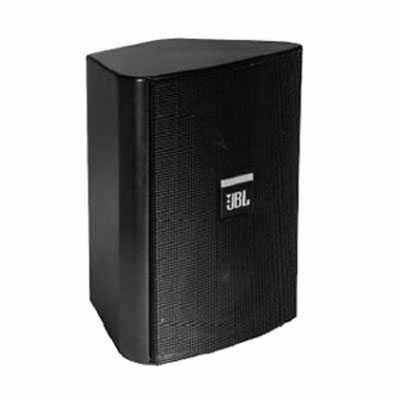 JBL Control 25T Surface Mount Speaker DJParts - All Variety of Parts that DJ Needs.  Components: 5¼” Polypropylene coated woofer, ¾” Titanium coated horn loaded tweeter. The Control® 25T is perhaps the most versatile of JBL Professional’s Control Contractor Series indoor/outdoor loudspeakers. Its robust nature makes the Control® 25T a perfect choice for restaurants, health clubs, outdoor theme and water parks or other applications where foreground/background music and paging are required. The Control 25T can be used in either 70.7V or 100V distributedline sound systems. Taps are provided at 30W, 15W and 7.5W (plus a 3.7W tap for use on 70.7V systems only). The unique and global patent pending InvisiBall ® mounting hardware is included in each system and makes short work of permanent installation. The InvisiBall mounting method adds the benefit of vertical rotation of up to 37° off-axis and horizontal rotation of up to 44° off-axis. Because InvisiBall adjustments are made through a hidden access behind the logo badge, the grill never needs to be removed and there exists a high degree of theft deterrence as well. The Control® 25T readily accepts a variety of paints and finishes to match any decor. Weather resistance is maximized by coating the woofer cone in polypropylene and terminating its circumference in JBL’s WeatherEdge™, a seamless, rubberized extension of the woofer surround that provides added protection to critical transducer elements. The polycarbonate tweeter diaphragm is reinforced with a thin film of titanium for added rigidity and endurance against sun, salt and moisture. Zinc plated grilles resist rusting in the harshest conditions. Available in black (Control 25T) and white (Control 25T-WH).  Control® 25T Compact Indoor/Outdoor Background/Foreground Speaker Tap #4 Tap #1 Frequency Response in half-space with 70.7V input, taps #1 through #4. For 100V input, raise each curve +3dB. Beamwidth Directivity Index,Q Horizontal Off Axis Frequency Response Vertical Off Axis Frequency Response (up) Vertical Off Axis Frequency Response (down) Horizontal 1/3 Octave Polars Architectural Specifications: The loudspeaker shall consist of a 135mm (5-1/4 in) low frequency transducer, 19mm (3/4 in) high frequency transducer, and frequency dividing network installed in a ported enclosure. The low frequency voice coil shall be 25 mm (1 in) in diameter. Performance specifications of a typical production unit shall be as follows: Usable frequency response shall extend from 80 Hz to 15 kHz (10 dB below rated sensitivity, in half-space, with no external equalization). The loudspeaker shall be equipped with a transformer for use in either 70.7V or 100V distributed-line sound systems with taps selectable by rotary switch. Taps shall be nominally 3.7W @ 70V (7.5W @ 100V), 7.5W @ 70V (15W @ 100V), 15W @ 70V (30W @ 100V), and 30W @ 70V (not used @ 100V). The frequency dividing network shall have a crossover frequency of 3.0 kHz. Rated power capacity of the components and network shall be at least 150 watts continuous program power, defined as 3dB above a test signal of filtered random noise conforming to international standard IEC268-5 (shaped pink noise with a peak-to-average ratio of 6dB), for 100 continuous hours duration. The system shall be protected against damage from occassional overpowering via full range series lamps that limits the power to the network and transducers. The high frequency transducer shall be horn-loaded to more evenly cover a nominal 90° horizontal by 90° vertical area. The enclosure shall be constructed of high-impact polystyrene for protection against the elements in outdoor applications, and for paintability. The grille shall be completely zinc-coated for resistance against rusting, shall be bake-painted black, and shall be secured via screws to keep it in place when facing downward. The low frequency transducer shall have a polypropelene-coated cone and a butyl rubber surround which shall extend seamlessly over the edge of the speaker frame for protection against the elements. The high frequency transducer shall be constructed of polycarbonate, reinforced with a titanium film for additional weather resistance. The system shall withstand Mil Spec 810 testing with specified time durations for exposure to the following environments with no effect on its acoustical performance or structural integrity: salt spray (method 509.3), temperature - 19°C to 49°C (method 501.3 and 502.3), 95% humidity (method 507.3) and ultra-violet (method 505.3). The system shall have a IEC 529 splashproof rating of IP-X4. For theft deterrence, the installation access area shall be hidden behind a snap-out cover, and the access area shall be on the front of the loudspeaker for ease of installation and adjustment. The loudspeaker shall be rotatable over a minimum of ±35° in all directions via a balltype mounting system. The ball mechanism shall be internal to the cabinet to allow low-profile mounting and better stability via a short moment arm. The logo shall be rotatable for proper orientation when the loudspeaker is mounted horizontally or vertically. The external wiring connectors shall be spring loaded and gold plated, and shall accept bare wire, single or dual banana-type connectors with 19 mm (3/4 in) spacing. Overall cabinet dimensions shall be no greater than 236 mm (9.3 in) high by 188 mm (7.4 in) wide by 148mm (5.8 in) deep and shall weigh no more than 3.6 kg (8 lbs). The finish shall be a paintable lighly textured black. The system shall be the JBL Model Control 25T with included Invisiball® mounting system.